This is a retrospective map of the city as it appeared during the reign of Elizabeth I and after the destruction caused by the great fire. 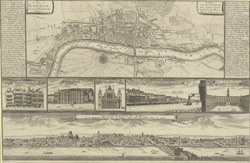 It was produced in the 1700s under the name of John Bowles, the map seller, with the small scenes across the centre of the map based on works by earlier artists. The view of the west facade of St Paul's Cathedral, which includes the renovations made by Inigo Jones, echoes a 1658 engraving by Wenceslaus Hollar. The view of Cheapside and the Cross is copied from a work by Callot, originally commissioned by the Queen Mother of France and England to commemorate her visit to London. The original depicted her travelling along Cheapside, but she has been omitted from this later copy. The view of Baynards Castle records the keep as it stood before the fire, when Elizabeth I was entertained by the Earl of Pembroke with dinner and fireworks.